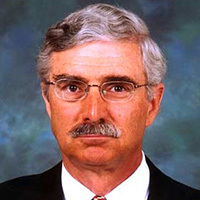 A Firestone manager, Ruff signed the agreement with Charles Taylor’s ministers in January 1992. A Liberian president, Tubman was a strongman who ran the country for nearly 30 years. Firestone corporate executives John Schremp and Richard Stupp meet with warlord Charles Taylor near Gbarnga, Liberia. 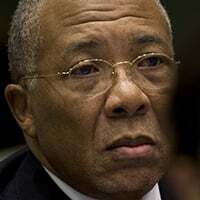 Washington diplomats warn Firestone about the dangers of doing business with Charles Taylor. Donald Ensminger, former general manager of the Liberian plantation, leaves Firestone. Firestone board of directors meets to approve deal with Charles Taylor. Firestone and Charles Taylor government sign memorandum of agreement. The company agrees to pay taxes to his rebel government in exchange for protection. The U.S. State Department annual human rights report is released to Congress. It says that Taylor forces carried out clandestine killings, raped women, looted homes and stole cattle. Firestone Chairman and CEO Yoichiro Kaizaki meets with Taylor representatives in Akron, Ohio. In late June 1991, a top Firestone corporate executive named John Schremp traveled from Akron to Liberia. He was a chemical engineer who wound up as director of human resources at Firestone’s corporate headquarters. In February 1991, the company’s new Japanese management made him head of the division overseeing the Liberia plantation. He had never been to Liberia or run a rubber farm. Schremp and another corporate executive, Richard Stupp, first visited the plantation, traveling in a sport utility vehicle with an armed guard. They passed through checkpoints manned by West African peacekeepers whom Schremp described as “professional soldiers.” Then the team passed into Taylor territory. There, the checkpoints were guarded by young boys with AK-47s. “We were shocked,” Schremp said, in a written response to questions. The agreement between Firestone and Charles Taylor signed in January 1992 committed the company to paying taxes and Taylor to providing protection. On July 3, Schremp got word that Taylor wanted to meet. Richardson, Taylor’s top adviser, would lead them to the talks. The team traveled up crumbling highways and dirt roads, past soaring cotton trees and the listless, mottled bush of central Liberia before they arrived at the autocrat’s capital in Gbarnga. From there, Schremp and Stupp were taken to the sprawling retreat that had been former President Tubman’s summer home. The visitors were escorted into a ballroom with parquet floors. A few minutes later, Taylor swept in. He sat in a chair that looked like a throne. For a few moments, Taylor’s ministers complained to Schremp and Stupp that Firestone had abandoned its workers. It had let down Liberia. According to interviews, Taylor told the executives that he wanted Firestone back in business. To do so, Firestone would have to deal exclusively with Taylor’s government. All taxes would be paid to Taylor. All labor problems would go through his ministers. 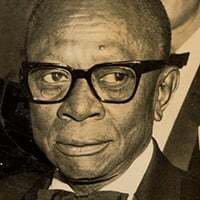 In effect, Firestone would treat Taylor’s government as the official government of Liberia — an economic, if not diplomatic, recognition that Taylor craved to establish the legitimacy of Greater Liberia. There was one thing that was clear: Ensminger had to go. 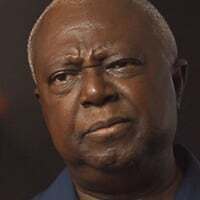 Taylor wanted an old acquaintance to take over — Weihe, the retired Firestone plantation boss who had dealt with Liberia’s politicians since the 1970s. Two days later, Schremp indicated Firestone’s willingness to accommodate Taylor. In a letter, he wrote that the company wanted Taylor’s “assistance and cooperation” to clean up the plantation, resume services at the hospital and get water and electricity running again. “We agreed that Firestone would be given permission to restart the plantation, feed the employees and put them back to work,” Schremp wrote in his written response. The company’s about-face was complete. Before, it had resisted the guerilla leader who had killed its workers, threatened to execute its managers and ravaged the country that had long been its partner. Now, Firestone decided to acquiesce. Ensminger was upset at Firestone’s newfound willingness to cooperate. He had spoken with Firestone’s attorneys. They had worried about potential legal problems – including breaking U.S. laws governing companies operating overseas. In the weeks after the July meeting, Ensminger flew back to Akron to protest the change in direction. He said he met with several senior Firestone executives. He and Schremp had a heated exchange. “I was very opposed to dealing with Taylor under his terms,” Ensminger said. Ensminger said Schremp called him into his office, and threatened to fire him. Ensminger would not accept the dismissal letter. He said he insisted on a mutual agreement in which he would not discuss the company’s actions, in exchange for a buyout package. Schremp consented, he said. In October 1991, Ensminger left Firestone. Schremp did not respond to requests for comment on Ensminger’s account. Firestone responded to Ensminger’s assertion that its decision to work with Taylor had been a mistake. We knew that Firestone support could fuel the war. And we didn’t think that would be a good idea. Firestone continued with its new approach. The change in tack stirred apprehension in Monrovia and Washington. While in Liberia, Schremp had paid a visit to Sawyer, the round-faced, genial interim president who had long opposed Taylor. In a recent interview, Sawyer said he found Schremp “elusive” when he asked about Taylor. Sawyer said he warned Schremp about the consequences of cozying up to the warlord. “We knew that Firestone support could fuel the war. And we didn’t think that would be a good idea,” Sawyer said. U.S. diplomats watched warily. In September 1991, Firestone executives spoke with State Department officials in Washington. The diplomats warned the company about the “difficulties and dangers of doing business in Taylorland” and of “potential legal problems,” according to one cable. Firestone is “reluctant to write off huge investments in Liberia but shows increasing frustration over efforts to conduct business ‘by the book,’ ” the cable continued. On December 17, 1991, almost two years after Taylor’s invasion, the board of directors met in Akron to discuss Taylor’s demands. 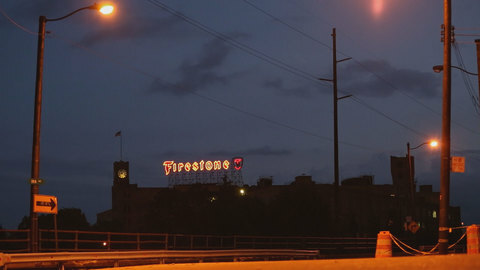 In exchange for being able to return to its operations, Firestone would work with Taylor’s government. It would make a “significant” capital investment to restore plantation assets that had been damaged and looted. The company would turn Buchanan, Taylorland’s biggest port, into a “viable entity.” Firestone managers would also be allowed to re-occupy homes that Taylor’s ministers and followers had taken over. The board, led by Chairman and CEO Yoichiro Kaizaki, approved everything, Schremp told Taylor in a letter. Schremp closed his letter by wishing Taylor the peace of the Christmas season, and hope for the new year. On the very day the board in Akron voted to go into business with Taylor, his fighters were stealing Firestone vehicles, looting nearby towns and had jailed and tortured two “hapless” villagers from Harbel, a Firestone official who visited the plantation told the U.S. Embassy. On Jan. 17, 1992, Firestone consummated its deal with Taylor. Gale Ruff, Firestone’s acting general manager at the time, headed to Taylor’s capital in Gbarnga. 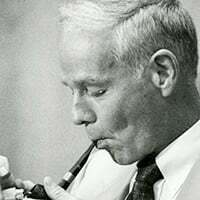 He had been advised to bring “beverages” to celebrate the signing of a memorandum of understanding between Firestone and Taylor’s self-declared government. In Gbarnga, several of Taylor’s top ministers presented Ruff with the text of the memorandum. The details had been hashed out earlier between Schremp and Taylor’s representatives. Ruff affixed his signature to the accord. In a recent interview, Ruff said that he was fuzzy on the event’s details. But he acknowledged signing the agreement on Firestone’s behalf. It was a remarkable document in the annals of corporate history. On Taylor stationery, which bore a scorpion imprint, the agreement’s preamble laid out the stakes. Taylor’s government wanted to improve the Liberian economy. Firestone wanted to resume operation of its rubber plantation. To do so, Taylor would return seized housing to Firestone’s managers. He would provide security forces to protect Firestone workers. I was basically handed a fait accompli. They needed a warm body on the ground to sign the paper. Firestone, in turn, would pay its Liberian workers in U.S. dollars. It would rehire the employees it had abandoned. Perhaps most important: Firestone would also make all arrangements necessary “for settlement of present and future financial obligations” to Taylor’s government. 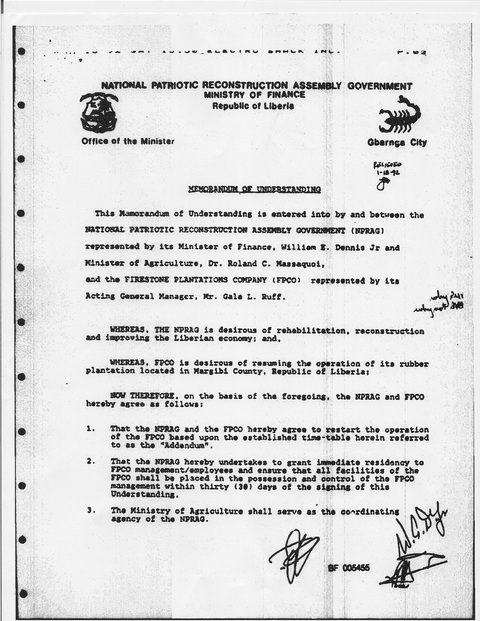 Firestone provided copies of the agreement to the U.S. Embassy and to officials in Sawyer’s interim government. At the time Firestone signed the document, there was still a hope for peace. But those expectations crumbled in the following months. Democratic elections called for by one peace pact in April 1992 never materialized. The horrors of the civil war continued to mount. The U.S. State Department’s 1992 report of human rights violations found that 20,000 to 30,000 Liberians had died during the previous year. More than 600,000 had fled their homes. Taylor’s rebels had detained some 4,000 West Africans for months, the report said. In one county, they killed as many as 1,500 people, mostly Krahn, and destroyed entire villages. They carried out clandestine killings, raped women, looted homes and stole cattle. Firestone, Padmore said, was unaware of the scope of Taylor’s violence. On May 22, at Firestone’s historic brick headquarters in Akron, the company confirmed its commitment to work with Taylor. There, at 8:30 a.m. in the company’s second-floor conference room, Kaizaki, the CEO and board chair, met with two representatives of Taylor’s NPRAG government, according to a Firestone corporate summary of the meeting. Kaizaki had assumed leadership a year earlier, with strict orders to restore profitability to the company. He spoke little English at the time. Firestone’s mostly Midwestern managers referred to him as Kaizaki-san — a traditional Japanese honorific. 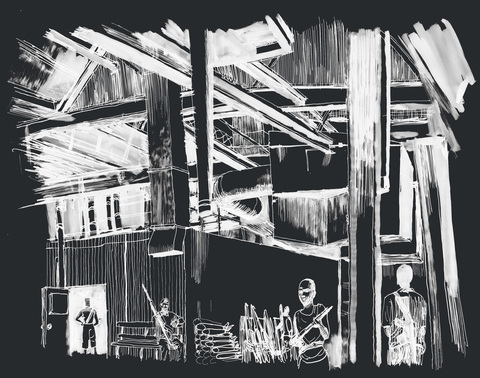 Kaizaki told Taylor’s men that he would be glad to return to Japan to spread the news that Liberia under Taylor was open for business — so long as Firestone’s plantation was running. In two brief phone interviews, Kaizaki said he recalled that Taylor representatives had come to Akron, but he did not remember meeting them. He did not dispute the meeting notes. He referred further questions to a Firestone spokesman. Kaizaki made two promises before the events in Akron concluded: Firestone would “use every possible effort to accelerate the startup of production and the commencement of paying taxes to the NPRAG.” Second, he would fulfill Taylor’s request. Weihe would become the new plantation boss.